Utilizing our exclusive NexD high-speed switching technologies, the ultra-compact JL Audio RD400/4 amplifier is engineered to deliver loads of audio output power, with incredible efficiency and low distortion. 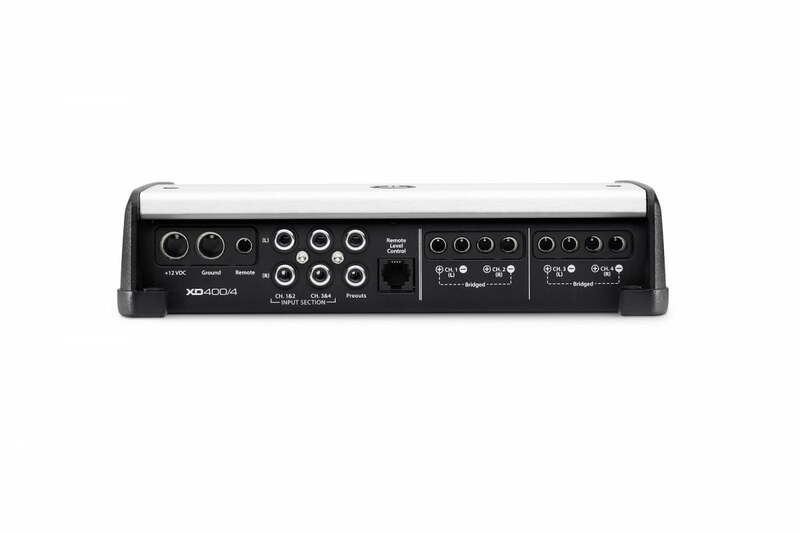 Don’t let its modern styling and small size fool you though, this little powerhouse churns out 100 watts of crystal-clear audio from each of its four channels into 2 ohms (14.4V, 1% THD) and is fully bridgeable, so it can be used as a 3-channel amplifier, or as a 2-channel amplifier producing a whopping 200W x 2 into 4 ohms. This tiny amplifier packs a serious full-range punch, delivering a staggering 100 watts to each of its four channels into 2 ohms (14.4V, 1% THD). The breakthrough that makes this much power possible in such a small chassis is our NexD ultra-high-speed switching design, which allows for full bandwidth Class D operation with extremely low distortion and outstanding efficiency. 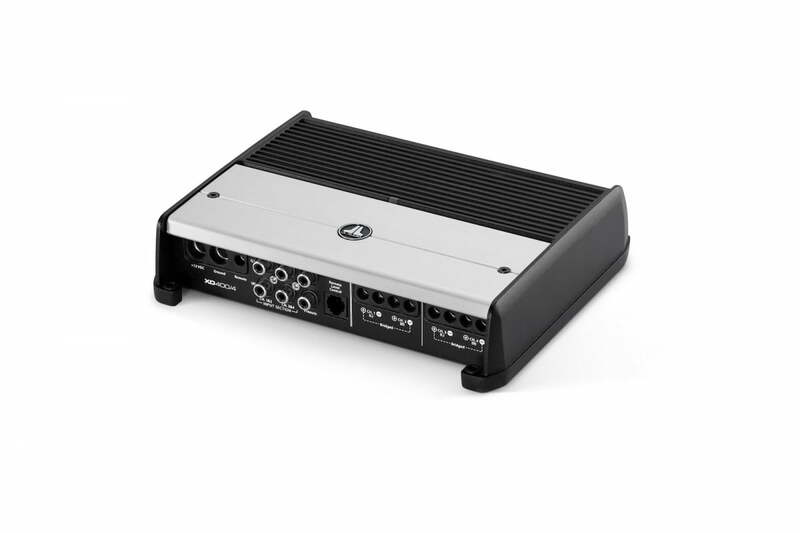 For your convenience, the JL Audio RD400/4’s controls can be found on top of the amplifier, beneath a protective cover, with all connections located along one side of its chassis. Studio-grade signal processing features include high or low-pass 12 dB / octave filters (defeatable) for each channel pair, with continuously variable frequency selection from 50-500 Hz, and dual-range, differential-balanced inputs capable of accepting most input voltage levels. 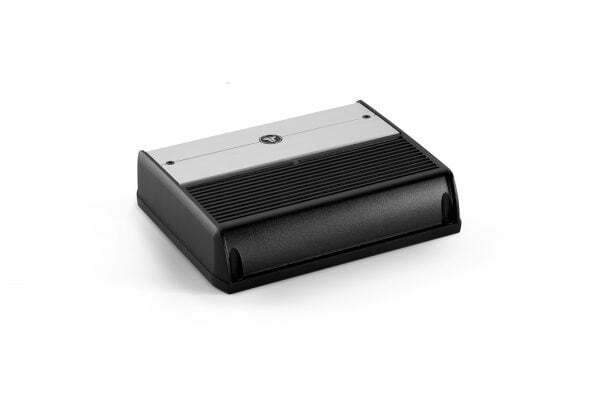 Automatic turn-on capability (via signal sensing or DC-offset sensing) is standard equipment, along with all-new input type switches for bridging of stereo output channels without needing to use Y-adaptors. Onboard LED-clipping indicators are also included with your JL Audio RD400/4. This all-new, innovative feature lets you easily set your amplifier’s input sensitivity settings, quickly and accurately, with no special equipment needed. You’ll also find a set of preamp outputs on-hand, so you can pass signals to another amplifier, almost effortlessly. The JL Audio RD400/4 features a durable, black powder-coated finish and a top-mounted, dual-color LED light strip that reports the overall status and condition.